The Philippines is the third largest contributor to ocean plastics in the world. Here, garbage is sorted. What are microplastics? What about a garbage patch? This glossary helps demystify plastic pollution. The world of plastic contains many confusing terms, as we discovered while reporting on and researching the topic for our June issue of National Geographic magazine. Even the most well-intentioned plastic consumer may have a hard time sorting out “good” plastics from bad. So we’ve prepared a short glossary to help demystify some of the terminology. Chemicals added during the manufacture of plastic products to make them stronger, safer, more or less flexible, and impart a range of other desired characteristics are known as additives. Common additives include water repellents, flame retardants, stiffeners, softeners, pigments, and UV inhibitors. Some of these additives may contain potentially toxic substances. A biodegradable product should break down into natural raw materials by microorganisms within a reasonable period of time. “Biodegrade” is more thorough than “break down” or “degrade”—when many plastics today are said to “break down,” they just become smaller pieces of plastic. There is no widely accepted standard for labeling a product “biodegradable,” meaning that there is no clear way to define what it means, and manufacturers apply it inconsistently. Some states are banning the term until a clear standard is agreed upon. This very flexible term is currently used for a whole spectrum of plastics, encompassing both fossil-fuel- and biologically based plastics that are biodegradable and biologically-based plastics that are not biodegradable. In other words, there is no guarantee that a “bioplastic” will be made from a non-toxic, non-fossil-fuel source, or that it will biodegrade. 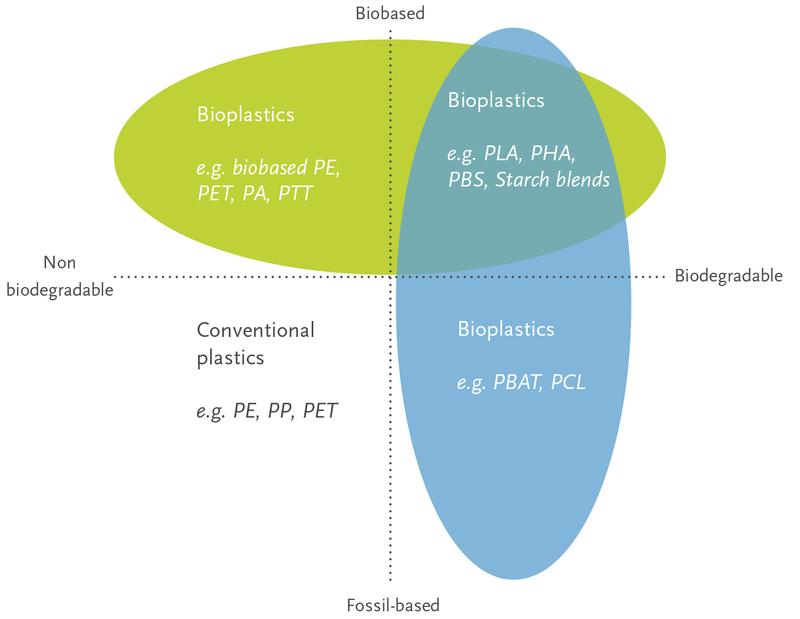 This graphic from European Bioplastics lists several of the main types of bioplastics. For an object to be compostable, it must be able to break down into its natural elements (or biodegrade) within a “reasonable composting environment,” which is variable. Some plastics are compostable, though most won’t compost in a typical backyard compost pile. Instead, they require much higher heat at a specific duration in order to fully biodegrade. Fishing gear—much of it made of plastic—that has been abandoned, discarded, or lost is often called ghost gear. This includes nets, lines, traps, buoys, and other material. This debris can entangle and kill sea life, including turtles, whales, sharks, dolphins, seals, fish, and seabirds. It can also smother coral. One estimate says that hundreds of thousands of tons of fishing gear are left in the ocean each year. Microplastics are plastic particles that measure less than five millimeters in their longest dimension. There are two types of microplastics: primary and secondary. Primary microplastics include resin pellets that are melted down to manufacture plastic products—also known as nurdles—and microbeads added to products such as cosmetics, soaps, and toothpaste as abrasives. Secondary microplastics result from the fragmentation of larger plastic items. Microfibers are individual plastic filaments that are woven together to make fabrics like polyester, nylon, acrylic, and so on. Regular wear-and-tear and laundering release microfibers into the air and water. Thanks to the action of ocean currents, marine debris often collects within ocean gyres (see below), forming what’s known as a garbage “patch.” In the largest gyres, these “patches” can span a million square miles. The majority of the material is plastic. The term patch is a misnomer as it suggests trash so thick it resembles floating islands. Actually, the patches look more like a peppery soup, because most of the debris is microplastics and because the trash is found throughout the water column, rather than just floating on the surface. One of the largest concentrations of marine debris is called the Great Pacific Garbage Patch (or Eastern Pacific Garbage Patch) and is located between California and Hawaii in the North Pacific Ocean. There are five major gyres on Earth, which are large systems of rotating ocean currents created by global winds and tides: the North and South Pacific Gyres, the North and South Atlantic Gyres, and the Indian Ocean Gyre. Gyres collect and concentrate marine debris into large garbage patches. All the major gyres currently have garbage patches, and new patches are frequently being found in smaller gyres. PET, or polyethylene terephthalate, is one of the most widely used polymers, or plastics. It is a clear, strong and lightweight plastic belonging to the polyester family. It is used to make common household items such as fibers, fabrics, beverage bottles, and food jars. Plastics, also called polymers, are produced by linking together small building blocks, or unit cells. Those building blocks, which chemists call monomers, are made up of groups of atoms that are derived from natural products or by the synthesis of primary chemicals from oil, natural gas, or coal. For some plastics, such as polyethylene, the repeat unit can be just one carbon atom and two hydrogen atoms. For other plastics, such as nylons, the repeat unit can involve 38 or more atoms. Once assembled, the chains of monomers become strong, light, and durable, which makes them so useful—and so problematic when they're disposed of carelessly. A system in which all recyclables—newspaper, cardboard, plastic, metal, glass—are placed in a single bin for recycling. The recyclables are sorted at the recycling center by machines and by hand rather than by homeowners. This approach has pros and cons. Supporters say it increases participation in recycling by the public, but detractors say it leads to more contamination—causing some recyclables to end up in landfills—and is more expensive to process. Plastic products designed to be used only once, such as thin grocery bags and the film packaging that seals everything from food to toys, is known as single-use plastic. Some 40 percent of all non-fiber plastics produced are used for packaging. Environmentalists often encourage people to reduce their use of single-use plastics and to instead opt for more durable multi-use items, such as metal water bottles or cotton totes.